I’m a self-help junkie. I’m all about understanding why we are the way we are, how to improve, and applying those things into our day to day lives. I’m easily inspired, and there’s something about learning about other’s stories, experiences, and advice that drives my creativity and inspiration. It’s no different when it comes to business. I love learning about new strategies, ideas, and processes and how I can apply them to both my personal brand and to any projects I’m working on. This is why my shelves are stacked with self-help, nonfiction and business books. It’s my go-to genre and I’m not ashamed to say it (although a little fiction here and there wouldn’t hurt, I’ll admit that!). One of my goals of 2018 was to finish all of the books I’ve been collecting over the years, and summer feels like the ideal time to tackle them. Below are some books I’ll be diving into and soaking up knowledge from this summer. I hope that, as an entrepreneur, you’ll find these books helpful and applicable to your business. Let me know what you think if you read one! I recently discovered the author, Bernadette Jiwa and after reading hunch, one of seven best-selling books she’s written, I was hooked. Bernadette Jiwa is a brand consultant based in Australia and works with businesses to create a strong brand marketing strategy that’s focused on storytelling. 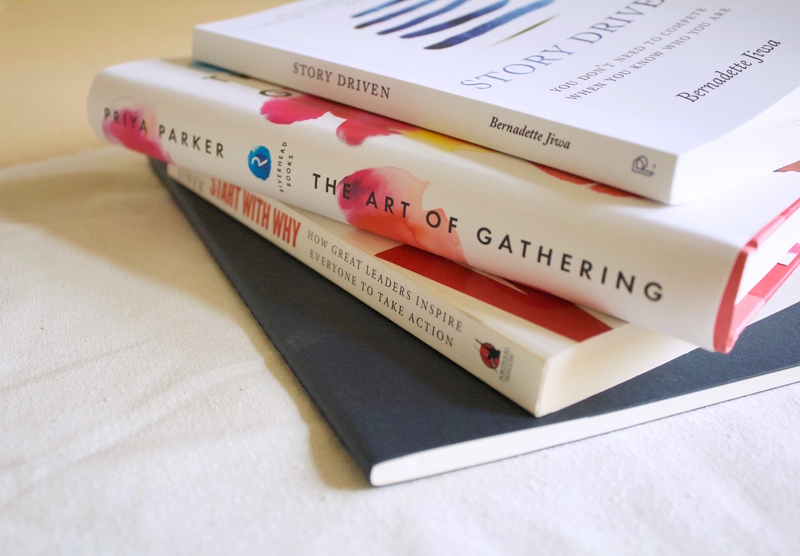 Since storytelling is at the heart of everything we do at Movers + Makers, I couldn’t wait to dive into her latest book, Story Driven. That mentality is a strong one that any entrepreneur can relate to. Your industry and market are most likely saturated and even if you’re doing something similar to the person next to you, there’s no one who can run your business quite like you can. Figure out who you are and what your story is, and you’ll be able to build a strong brand upon that. I’m really excited about this one. Since we started our events series back in January, I’ve entered a whole new world. Event production is a whirlwind of ideas, details, logistics, and hospitality all rolled into one (stressful) package. To say that I have a lot to learn is an understatement, but I’m ready to grow this branch of Movers + Makers! I feel like the need for events has only grown stronger as we spend so much of our time online. We started to crave in-person connection and intimate settings to meet, learn from one another, and share personal experiences outside of a screen. In her book, The Art of Gathering, Priya Patel acknowledges this need and shares how and why events should be made memorable. She makes the case that any event, whether it’s a business meeting or a backyard get-together, should be productive and worth our time (I’m personally looking forward to chapter three: Don’t Be a Chill Host). If you host events of any kind for your business (or you happen to be the party host amongst your group of friends), this book will provide tips and guidance for creating events or meetings that will leave a lasting impression. This is one of those books that’s been sitting on my shelf for years, but I’m just now picking it up because I finally feel like it’s applicable to my life. The universe has a funny way of working out that way, huh? Start With Why focuses on the “why” behind everything. The why is what drives your inspiration and is what will inspire others. As an entrepreneur, it can be too easy to get into the routine of things and to focus on checking off the to-dos on your list or hitting your next goal. But this book emphasizes the importance of always thinking about why you’re doing what you’re doing. If you focus on the root of why you started in the first place, you’ll be able to do everything with more heart and awareness which will ultimately lead to a thriving and more fulfilling business. If you’re looking for a more pragmatic approach to business, specifically in the marketing department, Content Inc can help you out. I’ve flipped through a few chapters of this book since adding it to my collection, but I’m going to dive in with full force this summer. We live in a world of content. Whether you love it or you hate it, it’s important for business owners to utilize content in order to reach our audience and build our brands. In Content Inc, Joe Pulizzi delves into how building an audience is the key to selling your product. He believes that by building a strong audience base first, you can create a product that your audience will want. This is a handy guide that’s full of strategy and tactics that any business owner can find useful, whether you’re new to content marketing or need a few new strategies to try out. As I’m writing this, I’m number 1 of 47 holds for this book at the library. My time has finally come! I’ve heard so many good things about The Female Persuasion. With a focus on friendship, mentorship, self-discovery, and an overall theme of feminism, what’s not to love? This book will be a nice break in between all the business reads.